Successfully Added HK Warehouse UMi Diamond Smartphone - 5 Inch HD Display, Android 6.0, Octa-Core CPU, 4G, 3GB RAM, OTG (White) to your Shopping Cart. With the launch of UMi’s latest smartphone, the UMi Diamond, this Chinese smartphone manufacturer is continuing its growing reputation as a well trusted manufacturer that delivers high-end smartphones at affordable prices. Beautifully designed the UMi Diamond comes in a sleek body that features a metallic finish. Its 5 inch HD IPS display delivers vivid colors, allowing you to enjoy all your favorite media in absolute stunning beauty. With an Android 6.0 operating system this latest Android phone is guaranteed to deliver a smooth and lag free user experience and lets you enjoy all the latest features the mobile industry has to offer. Holding a 2650mAh battery the UMi Diamond provides up to 6 hours of continuous usage time – enough to get through the day without needing to worry about running out of juice. Featuring OTG it allows you to connect external hardware devices such as keyboards or memory sticks to your smartphone. Additionally, OTG also allows you to use your phone as a power bank, a feature that may come in handy when you or your friends are in the dire need to recharge one of their electronic devices. Equipped with some serious hardware this Chinese smartphone comes with an Octa-Core CPU, 3GB of RAM and a Mali-T720 GPU. Head out to the Play store on your phone and download the latest Apps, HD movies, and most demanding mobile games. With the hardware this Android device is packing you can be guaranteed that you can enjoy the latest media and games in stunning detail without dropping a single frame. With 16GB of internal memory and up to 128GB available via an external TF card, the UMi Diamond holds enough memory for you to store all your files, music, saved games and more. Enjoy the fastest data speeds out there with the phone’s 4G connectivity. Download Apps in the blink of an eye and stream online movies in lightning speeds, with the UMi Diamond a laggy internet connection is an issue of the past. Dual-SIM and IMEI numbers additionally allow you to be connected to two different network providers simultaneously. Not only does this mean that you are reachable on two different phone numbers at the same time while using just one device, it also means you can connect to two separate 4G networks simultaneously – significantly increasing your data range. 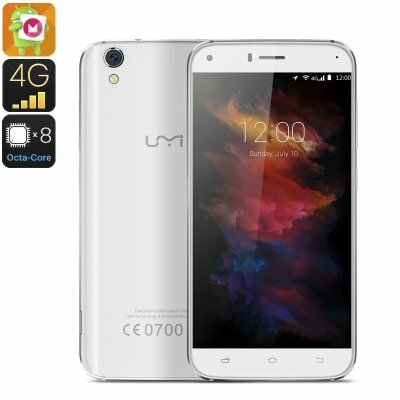 The UMi Diamond Smartphone starts at a little over $100 and comes with 12 months warranty, brought to you by the leader in electronic devices as well as wholesale Android phones..